I am privileged and honored to announce today that Ministry Bits, my new audio podcast, is going to be a part of the AIM Network. 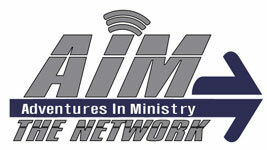 The AIM Network, or Adventures in Ministry, is a network run by Paul Spurlin in Montgomery, Alabama. They offer lots of free materials through their AIM Project website, as well as Podcasts, Devotional Songs, links, articles, and many other things. They work in close conjunction with Faulkner University and the Southern Evangelism Conference. It's a huge, wonderful step for Ministry Bits. We hope that even more people can become part of the network of ministers helping each other use the tools of technology for the betterment of the Kingdom of God. Nothing will change on the podcast - you'll still see and be able to listen to the shows here on the site or through iTunes. The shows will shortly be available on the AIM site as well as the AIM app. In addition to joining AIM's complement of podcasts, Paul and his gang are bringing me on in a design capacity as well. I hope that I can help them out and get these great materials and resources to the most ministers and youth ministers possible. The AIM Network is growing and expanding. I'm glad to be aboard. • And soon on the AIM Network!